Going into Kalispell we had problems with our ride height adjustments. The coach was low on the left front, so we had to bypass travel mode and adjust the ride height manually. We opted to continue into Kamloops that way and get it fixed there, as we were meeting up with Ted's brother Gary, and there was already some fly fishing scheduled with a local guide. Turned out that the problem was a stuck solenoid that only needed a bit of banging around to get it to work. On our way from Kalispell to Kamloops we first had to cross the border. Last year we were searched completely as we went into NB. This year we just talked to a border guard for about three or four minutes and then were told to have a nice day. Things seem a bit more pleasant here on the frontier. 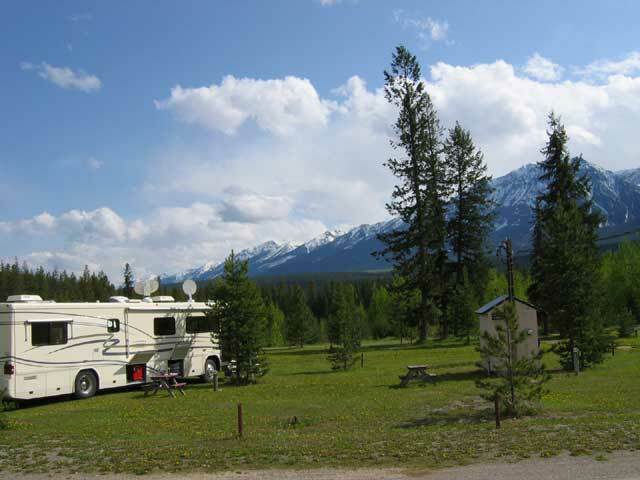 As we headed north we drove along the eastern side of the Canadian Rockies up Hwy 93/95 and then headed west on TCH 1 just north of Golden. 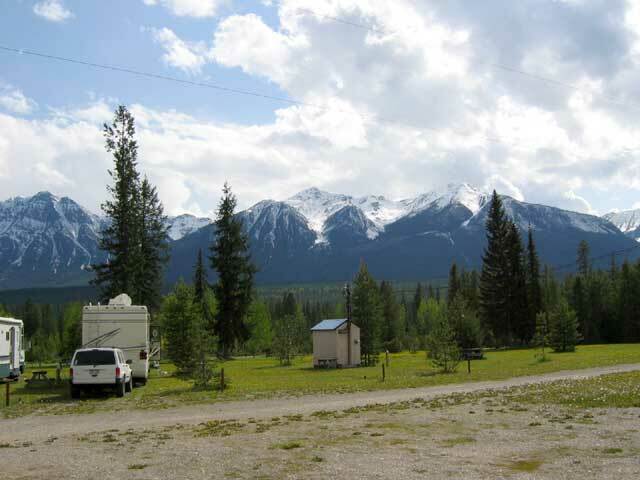 We found this small campground where we spent a beautiful evening surrounded by snow capped mountains. 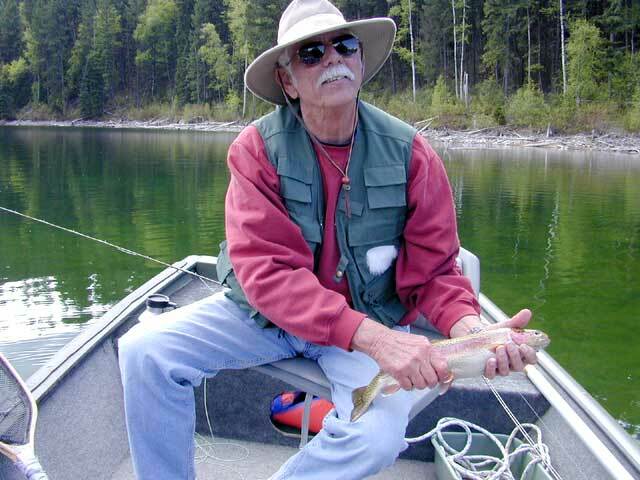 Kamloops is in the Okanagan area of BC and is noted for its lake fly fishing. It is a city of about 80,000 and the campground where we were staying was noisy with all the traffic and trains. So, we left early, as soon as the fishing and coach repairs were completed. The fly fishing on Heffley Lake was not what we expected. We were hoping for a hatch that never came. So we didn't get the large amount of action that this lake area is noted for. But we did get some good fish like the one Gary is holding. 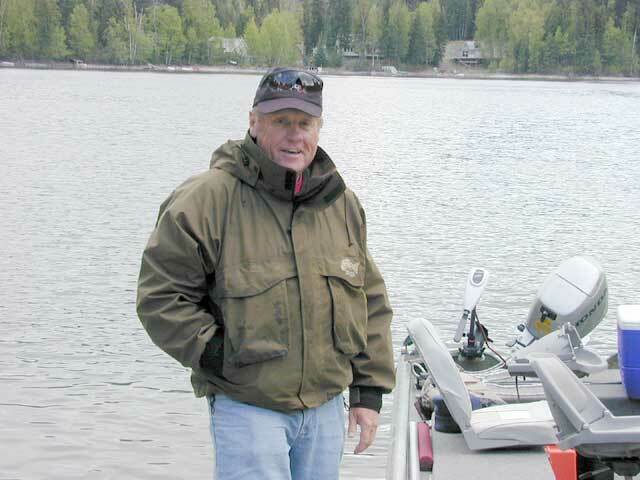 Our guide, Gordon Honey is the author of "Flyfishing Small Lakes For Trout" and is a wealth of information on still water flyfishing. All in all, we had a great day learning as we fished. At lunch time, you sit in the boat with your line in the water while you eat a great lunch and drink a very nice Merlot. Not too bad a way to go, eh?